Let's take a look at some grizzly theatre history. 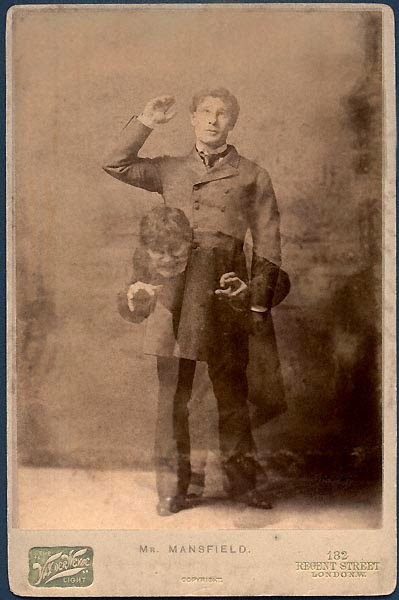 19th century actor Richard Mansfield as Jekyll and Hyde. In 1888, London's theatreland was all about Dr. Jekyll and Mr. Hyde. Two Broadway productions of Jekyll & Hyde, one starring actor-producer Richard Mansfield and another written by and starring German actor Daniel Bandmann, were planning a London transfer. Allegedly Bandmann had first been inspired to create competition for Mansfield's production after Mansfield refused his request for complementary tickets to his show. So, when Mansfield announced his plans to transfer his Jekyll to London in September, Bandmann aimed for August – finally, the two productions premiered right after each other on August 4th and 5th of 1888. It's fascinating to think how the 1888 audiences experienced Jekyll and Hyde's story. In the past century, Jekyll and Hyde have become household names. Their story is taught at schools and has been the subject of countless adaptations and parodies. The theme of good and evil is always relevant, so it's no wonder the tale still fascinates audiences – but when we these days enter a theatre to watch Jekyll & Hyde, we know from the start what the relationship in between the titular characters is. Reading the original novel, same deal. The central mystery has been spoiled for us by common knowledge. But imagine entering the theatre in 1888, only two years after Robert Louis Stevenson's novel was first published. The novel was an instant success, so I'm sure many spectators knew the drill. But since it was still such a new tale, it's possible some of the audience members back then saw the play without knowing how it was going to end. For them, it must've been an especially thrilling experience! Nowadays, you cannot have a Jekyll & Hyde adaptation where the conflict centers around solving Hyde's true identity, though that's exactly how the book works. But back in the 19th century, the onstage productions still trusted the novel's structure to have shock value and only revealed Jekyll as Hyde in the third act. A true test to the skills of the lead and the costume and makeup designers, I imagine – portraying the two characters so differently that the reveal would really surprise the audience. Jekyll and Hyde are indeed played by the same actor! Nowadays, London in the fall of 1888 is of course associated with something quite a bit darker than onstage productions of a Gothic thriller. Only two days after the premiere of Bandmann's production of Jekyll & Hyde, a woman was murdered in London's Whitechapel district. Nowadays, it is suspected she might have been a victim of the unidentified serial killer known as Jack the Ripper, and she was not the last one. As the theatrical productions continued to treat their audiences to Mr. Hyde's fictional terror, the East End murders terrified Londoners for real. Possibly the culprit is an army doctor suffering from sunstroke. He has seen the horrible play, lives in Bayswater or North London, in perhaps a decent square or terrace, dressed well. Goes out about 10pm straight to Whitechapel. Commits deed. Home again to breakfast. Wash, brush-up, sleep. Himself again – Dr [sic] Hyde. Meantime, everybody scouring the scene of the tragedy for the usual type of a murderer. "He has seen the horrible play" indeed. The magic of live theatre – might cause murders! Media blaming various forms of entertainment for violent behaviour seems to have long traditions. Some people went beyond merely accusing the fictional story of giving the murderer ideas. Lead actor Richard Mansfield was briefly under suspicion for the murders. Some theatregoers couldn't believe an actor could portray the monstrous Mr. Hyde without having an evil side to his own personality. In a sense, Mansfield was accused of being too good an actor! According to some sources, one theatregoer went as far as to actually tell the police about their suspicions regarding Mansfield. Rumours also had it that Scotland Yard questioned the actor. Of course, Mansfield was never arrested. He nevertheless felt a need to clean his reputation. In wake of the accusations, he produced a charity performance to raise money for reformed prostitutes. 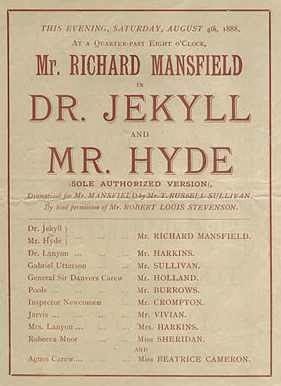 Mansfield went on to perform the role of Dr. Jekyll and Mr. Hyde in various productions, all the way until his death in 1907 – so it doesn't seem the rumours hurt his reputation too deeply. Even so, his name is still mentioned on lists of possible Jack the Rippers to this day. He was even portrayed in the 1988 TV series "Jack the Ripper" as a suspected killer. After the initial rumours that connected the story, the actor and the killer, Jack the Ripper's crimes have every now and then popped up in various adaptations of Jekyll & Hyde. A 1971 Hammer Horror film "Dr. Jekyll and Sister Hyde" has a male Jekyll transform into a woman – and also portrays Ms. Hyde as Jack the Ripper. The 1989 film "Edge of Sanity" mixes the character of Hyde and the crimes of the Ripper, with Anthony Perkins in the dual role. 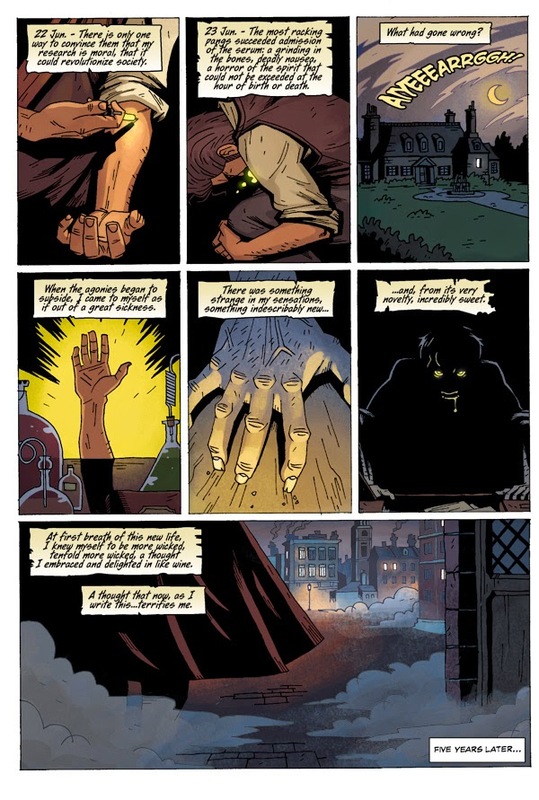 A 2011 comic called "The Strange Case Of Mr. Hyde" by Dark Horse Comics features Dr. Jekyll hunting down Jack the Ripper. A movie adaptation of the comic was announced in 2011, but it doesn't seem the film is in the works anymore. There is also a 1997 computer game called "Mystery in London: On the Trail of Jack the Ripper" that connects the Ripper with Stevenson's novel. And of course, there is the musical. As I mentioned in my earlier post, some versions of the script set the story in autumn 1888 as a memento of the Jack the Ripper references otherwise cut from the show. We have got the craze and for the next few days will be Dr. Jekyll and Mr. Hyde on the brain. No matter the grave rumours that connected the story with murders, it's amazing to think that theatrical adaptations of Jekyll & Hyde got fans excited in 1888 just like they do in 2015! This article and its related pages were a fantastic source for this text. If you wish to learn more about the 1888 productions of Jekyll & Hyde and their connection to Jack the Ripper, go check it out!